Summary: On 3 June 1963, Pakistan saw its first cases of mass anti-Shia violence, with the killing of over one hundred in the village of Theri, as well as attacks in Lahore and Narowal. On the fiftieth anniversary of these events, described by Sharaabtoon research, far from being seen as isolated, they can sadly be identified as the opening act of the fratricidal killings between Sunnis and Shias in Pakistan which still continue after fifty years. In a piece of original research, Sharaabtoon is proud to bring you the first collation of the evidence, most of it not available on the internet, on the opening salvo of Pakistan's ongoing sectarian conflict: the Theri massacre of June 1963, and the accompanying violence in Lahore and Narowal. In spite of the widespread attention these events received in their immediate aftermath, since then they have become largely forgotten or ignored outside of the communal memories passed down within the Shia community of Pakistan. Adding to the tragedy of these events is the fact that, despite the many condemnations the killings received at the time from all corners of Pakistan, sectarian violence, particularly against Shias (but also against Christians, Hindus and Ahmadis) has continued to plague the country. Thousands of Shias have been killed since 1963, with their murderers citing religious reasons as 'justification'. Strange as it may sound to unfamiliar observes, within the minds of the perpetrators such killings of Shias falls as much under the banner of jihad as the killing of unbelievers does. After one massacre in February 2012 this year, a commander of the Jundulluh faction of the Pakistani Taliban claimed responsibility for the attack with these words: "They were Shiite infidels and our mujahedeen shot them dead one by one after bringing them down from a bus." This conception of Shias as "infidels" (كفّار) is at the root of most anti-Shia violence, and springs usually from an accusation that Shias have "deviated" from "true Islam" by their reverence for Mohammed's son-in-law Ali (as Mohammed's supposed true successor) and other members of his family, as well as differences in practices such as prayer. This particularly comes to a head during the public displays of the differences between Shia and Sunni religious views, such as during the processions of the Day of Ashura, which was the case in 1963. Shia processions remain a main target, frequently being targeted with bombings by organisations such as the Pakistani Taliban, as well as a vast network of smaller violent jihadi groups. Many of these groups have received the patronage or tacit cooperation of various arms of the Pakistani government and armed forces, who often see them as useful proxies against India, or a "last line of defence" in case of a future invasion. Although the violence in Pakistan is largely directed against Shias by Sunni jihadis, reverse attacks do occur: a wave of sectarian violence between the two communities (with attacks on both sides) flared up in Gilgit (northern Pakistan) last year after a hand grenade was thrown at a gathering of a Sunni organisation (purportedly by Shia militants). Like so much of the Sunni-Shia violence seen since, these events centred around the Day of Ashura. This is the tenth day of the month of Muhharam in the Islamic calendar, on which Shia Muslims mourn the death of Hussein ibn Ali at the Battle of Karbala. This battle was the climax of the struggle over who should lead the followers of Islam after the death of the Prophet Mohammed, with the Umayyad Caliph Yazid I defeating Hussein (Mohammed's grandson). Shias mark this day with processions and displays of public mourning, and have often consequently clashed with Sunnis, as the diverging points of their sects are brought out into the streets. One consequence of the great forgetting surrounding the events of 1963 is that even the date on which they occurred has become obscured, with many Shia sources now identifying the date as 6 June 1963. 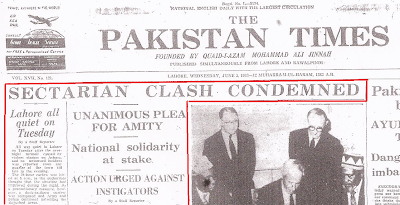 However, the Day of Ashura in 1963 fell on 3 June, and the contemporary newspapers began covering the killings on 4 June, noting the date they were perpetrated as 3 June (and the night of 2 June in Lahore). Throughout Pakistan on the Day of Ashura in 1963, there were a great many peaceful processions and commemorations, including in Karachi, Peshawar and Multan. However, Lahore proved to be far more turbulent. The origin of riots seems to be found in events of the night before, when Sunni-Shia scuffles broke out, and bottles and broken bricks ("brick-bats") were thrown at a Shia procession that had halted outside a Sunni mosque (Dawn: 5 June: p.11; The Pakistan Times: 4 June: p.1). Members of Sunnat-Jama'at (a traditionalist Barelvi Sunni organisation) tried to rush the procession and had to be prevented from doing so by a police baton charge (The Pakistan Times: 11 June: p.9 ; Dawn: 12 June: p.6). By the morning of 3 June, rumours were spreading that Shias had killed two Sunnis near the mosque where the procession had halted (The Pakistan Times: 12 June: p.3 ; Dawn: 12 June: p.6). Stone-throwing against the Shia processions ensued, and, despite assurances from Sunni leaders that they would be allowed to pass freely, when a large procession passed the Bhati Gate, what was described as a "free fight" broke out between the two groups, and the police opened fire to restore order. As broken brick-throwing started against processions in other areas, Army units were called in, and the police repeatedly opened fire throughout the city (Dawn: 5 June: p.11 ; Dawn: 27 June: p.1). Witnesses later reported seeing two Shias being beaten by a crowd which the police had just dispersed from the Bhati Gate (The Pakistan Times: 27 June: p.11). A curfew was imposed and maintained for several proceeding nights. More than eighty people were injured in these riots, and four people (including one policeman) eventually died of injuries they sustained on 2 and 3 June (Dawn: 5 June: p.11 ; Sawn: 6 June: p.9). Police registered incidents of "stabbing, arson and loot" throughout the two days (The Pakistan Times: 6 June: p.5). In the following days, six hundred and thirty people were arrested in association with the riots, though over seventy of these were for violating the ensuring curfew (The Pakistan Times: 7 June: p.11 ; The Pakistan Times: 8 June: p.1). This kind of violence was new to Lahore. It was reported that “elder citizens of the town… could not recall such a violence in Lahore on Ashura during the last 150 years” (The Pakistan Times: 5 June: p.1). 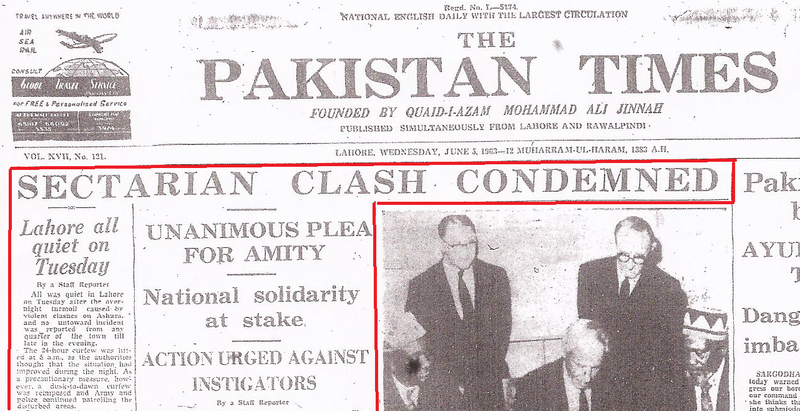 An inquiry into the violence was ordered by the Governor of West Pakistan, but this was (to quote one news report) “not so much for fixing the blame of the incident, but for assessing the causes for the tension between the two sects, and for remedies to prevent such recurrence in the future” (The Pakistan Times: 5 June: p.1). Not surprisingly, Pakistan's Shias were left with a sense that little was done to bring the instigators of the riots to justice, and by July the kind of "future remedies" being suggested to prevent such riots included the pre-publication censorship of all Shia religious literature to remove content Sunnis found "objectionable" (The Civil & Military Gazette: 2 July: p.4). Quickly, those who had largely been the victims of the riots were blamed for causing them in the first place. Far more bloody than the riots in Lahore were the killings in Theri (or "Therhi"), a village in Khairpur district. The incident began with a single stone-throwing against a Shia tazia (processional model of Hussein's mausoleum), and when news of this reached Khairpur city, a large number of armed men descended on the town and set both the tazia and the house where the Shias were meeting on fire (The Pakistan Times: 6 June: p.5 ; Dawn: 5 June: p.1). What followed was described as a "pitched battle" by the time the police arrived and used tear gas to disperse the mob, with re-enforcements from nearby towns and even the Indus Rangers being called in (The Pakistan Times: 6 June: p.5 ; Dawn: 5 June: p.1 & p.11). A dawn-to dusk curfew was imposed for several subsequent nights. Over one hundred people were killed and at least thirty injured in this massacre (CGI: 18 April 2005: p.9 ; Dawn: 9 June: p.13). The characterization of the incident as a "battle" seems to be contradicted by the fact that almost every victim was identified as a Shia. In the following weeks, ninety-eight people were arrested from all over Khairpur district on charges of arson, murder and riot in Theri (Dawn: 27 June, p.1 & P.7). As with Lahore, a government inquiry was ordered, but later suspended and seems not to have reached any real conclusions (The Civil and Military Gazette: July 3: p.3). The accounts passed on by victims and witnesses of the killings in Theri present a lurid picture. Knives, axes, and stones are said to have been used to murder the processionists. The perpetrators reportedly walked through the area of the attack shouting Shia slogans and offering water, only to murder any of the wounded who replied (Shaheed Foundation Pakistan). The dead bodies were then thrown into a well in an attempt to conceal the scale of the killings (with some sources saying the next planned step was to burn them in the well) before the police arrived to take custody of them. (CGI: 18 April 2005: p.9 ; Shaheed Foundation Pakistan). The Shaheed Foundation of Pakistan has preserved a number of (graphic) photographs showing the state of the bodies recovered and the site of the massacre. Many of these accounts describe the perpetrators as "Wahhabis", but the tiny size of the Wahhabi population of Pakistan at this time suggests that they were likely more mainstream Sunnis. Under the protection of the Pakistani police the Shia ceremonies that had been interrupted by the killings and the ensuing curfews were completed on 7 June, without violence violence (Dawn: 7 June: p.7 ; The Pakistan Times: 8 June: p.10). In subsequent years, however, there was repeated anti-Shia violence in this and nearby villages on the Day of Ashura. In Narowal, before the Ashura procession went ahead, an agreement was struck between the Sunni and Shia communities that the march would be made up of only ten Shias. On the day, only nine went, but they were escorted by four prominent Sunnis walking alongside them. The Pakistan Times reported that, as the procession passed through the town, some Sunnis began “abusing the Shias and also instigating the Sunnis to attack them as they had not carried out the agreement made earlier. The situation took an ugly turn when the rival groups started exchanging brickbats on the mourners. At this point the police intervened and the furious mob started throwing brickbats on the police as well” (The Pakistan Tunes: 6 June: p.8). The mob was ordered to disperse, and the police made an unsuccessful attempt to disperse it with a baton charge. When this failed, the police then fired “to scare away the crowd” (The Pakistan Times: 6 June: p.8) Later, about five hundred persons gathered armed with improvised batons and axes and attached the processionists. The Police fired for a second time, injuring “several persons” and killing two (The Pakistan Times: 6 June: p.8). In this case, many of the leaders of this attack were not only arrested and charged, but also named in Pakistani newspaper stories (The Pakistan Times: 6 June: p.8). All involved seem to have been locals, well-known to their victims. The events in Theri, Lahore and Narowal acted as a bloody opening to the ongoing dark chapter in Pakistani history, and the nation as a whole has yet to come to terms with the ongoing violence. At the time, one newspaper correspondent described it as "the most unfortunate incident in the history of the country" (The Pakistan Times: 5 June: p.9), but many more tragic atrocities have since been committed. Pakistan's founder, Muhammad Ali Jinnah, one said that "There is no power on earth that can undo Pakistan." We have yet to see if Pakistan can undo the ongoing spiral of sectarian strife which still plagues it after fifty years. Copyright 2013. Watermark theme. Theme images by mammuth. Powered by Blogger.